The following post is excerpted from our new eBook, The Busy Founder's Guide to User Onboarding. It's been edited for context. How do you know what sort of initial customer experience is appropriate for your business? We've all walked into shops where a sales assistant is a little too pushy. And many of us have signed up to an online service only to be greeted by a bewildering screen with no clear next steps. Very often, these experiences evolve because the customer's first experience — whether in real life or online — hasn't been considered as an integral part of the sales process, but has been treated as an afterthought, or as inferior to the product itself. If we want to get customer experience right, to increase our customers' willingness to buy from us and decrease their propensity to stop buying from us, we need to change that. Figuring out how much help your users actually need is key to designing a user onboarding strategy that works for both you and your customers. And to work it out, you'll need to consider two things — the distance to value, and your users' motivation. In most use cases, the distance the user must travel in order to gain value from a product will play a significant role in determining the onboarding requirement. That means the further your users need to walk to find success, the more help they'll require to get there. As an example, consider internet-to-text services, which were popular in the mid-2000s as a ‘free’ alternative to using the then-expensive SMS services that came with cellphone plans. Most of these sites had two screens — a signup screen, and a ‘send message’ screen. I vividly remember these apps, for two reasons: they were phenomenally useful, and they were very, very easy to use. The distance for the user to reach value was minimal, and a better onboarding experience would likely not have improved the experience of the user or the profitability of the company. Compare this example with that of a fictional B2B SaaS app for scheduling, which is ostensibly a medium-complexity use case. For a user to gain value they must travel a significant journey from the point of signup. The fictional onboarding to-do list would likely include items such as importing/linking calendars, setting up a work day, setting up notifications, adding team members and probably more besides. In the latter scenario, the distance to value is so great that the risk of a user falling off the path is significantly higher, and the onboarding process would play a significant role in mitigating such risk. 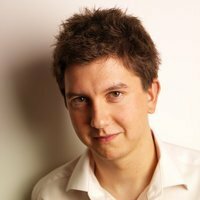 What role does user motivation play? Humans are, by nature, a lazy bunch. The brain makes up roughly 3 percent of people’s body weight, and consumes 20-25 percent of our daily energy supply, so any opportunities we get to save it some hassle, we’ll take them. The fact that we’ll generally take the path of least resistance had broad implications for product design and more specifically, user onboarding. From the time that a user begins closing the distance to value, their mental willpower is being sapped, and how much of it they have in reserve is a key determinant of how important onboarding is to any given business. For example, a user adopting a piece of software at the request of their company or manager probably has a relatively high level of motivation — though it’s likely to be extrinsic motivation, rather than intrinsic. The downside of failing to comply with a request is substantial, perhaps all the way up to dismissal. A user in this circumstance is far more likely to persist through a difficult process to the point where they reach the value they’ve been promised, even if they have to learn new skills (or wade through mud) to do it. Extrinsic motivation is a powerful factor in employment, and intrinsic motivation is a powerful feature in personal development. A user onboarding within a weight-loss app, for example, may have almost no level of extrinsic motivation to continue, but particularly strong intrinsic motivation pushing them onto success. Conversely, take the example of the early days of Twitter. Signing up was easy, but extracting any type of value from the product was difficult until some significant changes were made to the signup flow. Often, consumer products (with a couple of exceptions, such as banks or medical websites) can’t afford to make things harder for the user, because their motivation, whether extrinsic or intrinsic, is often far lower. In these cases, a strong onboarding process can make the difference between an app’s success and failure. 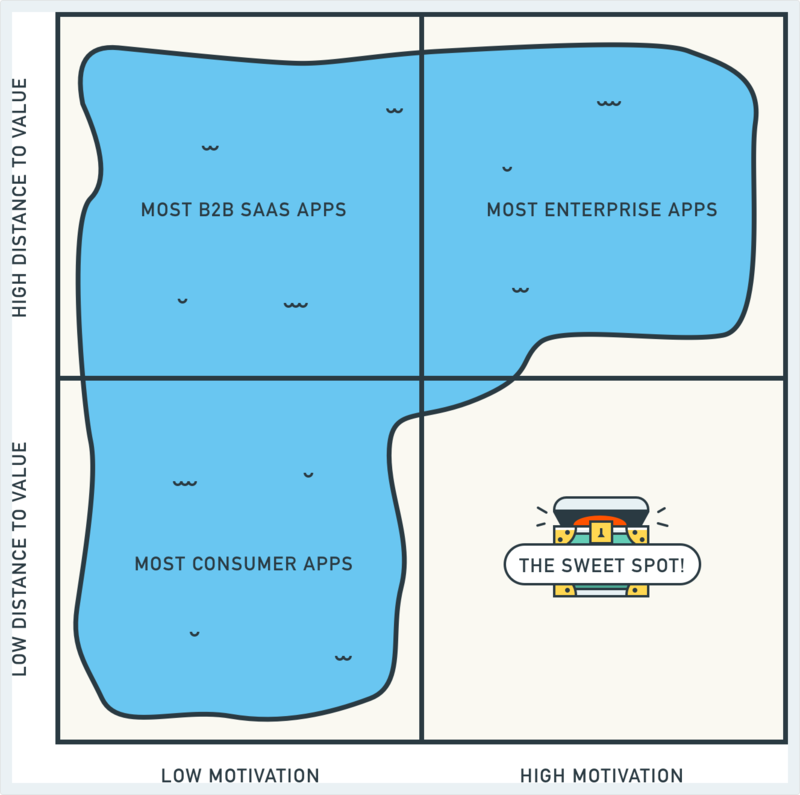 In our experience, the majority of B2B SaaS apps fall into the upper left quadrant, where user motivation is low and distance to value is high. Enterprise apps tend to fall into the upper right quadrant, where extrinsic motivation is high and distance to value is high — in many cases, onboarding is overlooked. Consumer apps more generally fall into the bottom left low distance to value and low motivation quadrant, making onboarding important. Sadly, very few apps are in the 'sweet spot', with low complexity and low distance to value. Like these ideas? 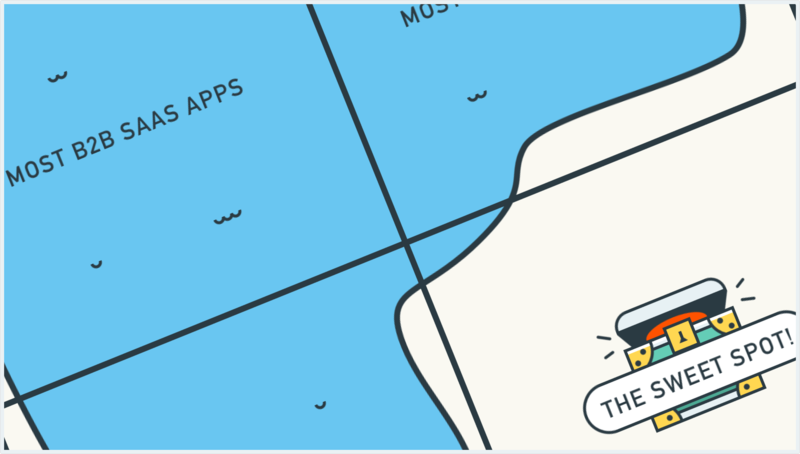 Download our new eBook, The Busy Founder's Guide to User Onboarding, here.